Raise $25,000 and you get $50,000. Scare up $100,000 and you get a 4 to 1 match for $400,000. No wonder there are 16 candidates for mayor. It's political happy hour... this is a poor use of public funds. This is the first mayoral race with public financing and voters are learning that it allows candidates to get easy money and, in some cases, to waste it. The weird catch-22 of San Francisco's system is that once the money is spent, a candidate can't drop out of the race unless he or she pays it back. The problem is that a 2007 change in the law made it possible to start pulling in the money nine months before the election. By the time August rolls around, candidates may be hundreds of thousands of dollars in the hole and can't afford to quit." So we have candidates who are only in the race because we the citizens of SF are paying them to run for mayor with our money. And the peculiarities of our public finance rules mandate they stay in the race in order to continue to suckle at The City's bountiful teat. But this is all fine because - you know - we in SF have a lot of extra money lying around to finance any candidate who wants to run for mayor. Why would we not want to spend $9 million of our tax dollars for the privilege of sorting through sixteen mayoral candidates? I sure can't think of anything better to do with that money. 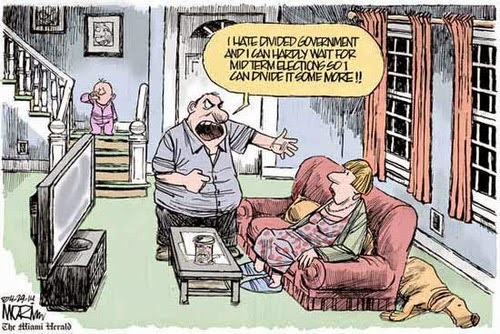 "San Francisco voters, as usual, have a lot on their plates. On Nov. 8, they will select a new mayor, district attorney and sheriff, and they will decide on eight ballot measures. In the mayoral race, in particular, the burden of choice will be heavier than in most past elections. Voters must choose from a crowded field of 16 candidates, 10 of whom are current or former officeholders and most of whom are serious, well-funded contenders.Under the city's ranked-choice voting system, the voters will need to do more political homework much earlier than in the past, because this election will be a one-day sale without the option of a later runoff election simplifying choice, for good or ill, by whittling the 16 down to two. And as the voters survey the candidates to decide how to rank and vote for up to three, they will also need to consider two rival charter amendments that address the central focus of recent campaign debates, namely, how to control San Francisco's accelerating public pension obligations and rising health care costs to secure the city's financial future." Who knows what kind of a gawd-awful mess will come out of this election? Recall that in Oakland's 2010 ranked voting mayoral election, candidate Jean Quan had 10 points fewer first choice votes than Perata in the first vote count. I am talking about - Her Honor Jean Quan, the current mayor of Oakland, who had 10 percentage points fewer first choice votes than the loser Don Perata. The simple fact is that most SF citizens have no friggin' clue about the ramifications of ranked voting/instant runoffs. While the voters may not understand it, be assured the candidates who would otherwise have zero chance of winning a plurality in the election or a majority in a real runoff know how exactly how the voting system can be gamed. Net net - As a voter it is more important to decide who to exclude from any of your three votes for mayor than it is to pick who you would prefer to see win as your first choice. In fact you may be better off ranking your favorite as your second or third choice. This is Game Theory Gone Wild. We might as well be drawing lots to pick the next mayor. At this point, all I know for certain about my mayoral vote is that John Avalos will not get any of my three votes. In my other blog I have focused primarily on his position on Sharp Park. Obviously that is not the only or even the most important issue facing our city. However, that issue is indicative of a bigger problem with his character and candidacy. 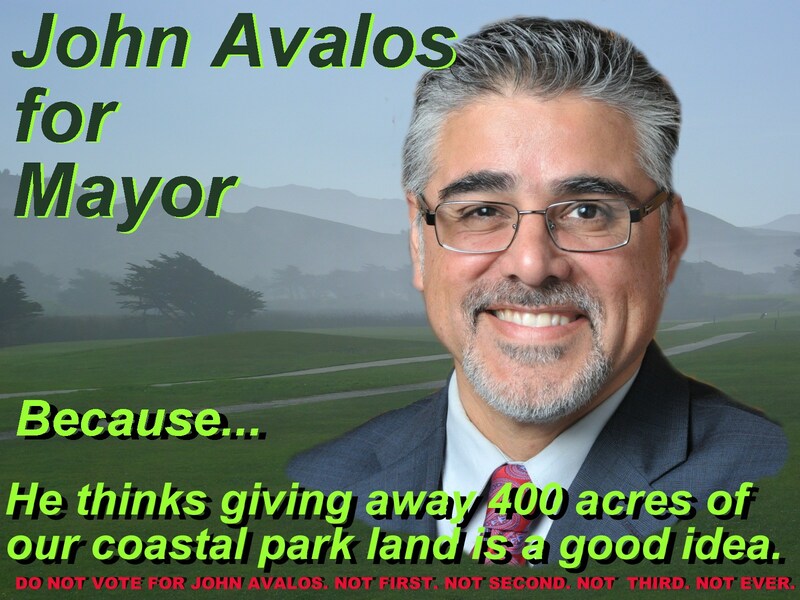 If Avalos is willing to pander to the most radical progressive constituents, to secure their support by denying the unassailable science and documented accounting on our wonderful Sharp Park, and even go so far as to advocate giving away this historically important 100 year old legacy that was a gift to the people of San Francisco, then he cannot be trusted with any leadership role in our city government. But with our convoluted crapshoot of an electoral system, and enough second and third place votes, he could very well be our next mayor. I only regret I have but three votes to not give to John Avalos. "Do Not Vote for Avalos - Not First, Not Second, Not Third, Not Ever." X-posted from my other blog. It's not that easy. But it isn't very hard either. Raise $25,000 and you get $50,000. Scare up $100,000 and you get a 4 to 1 match for $400,000. No wonder there are 16 candidates for mayor. It's political happy hour. Holy Guacamole, Batman! That's the stupidest thing I ever heard. Political happy hour, indeed. I think I should rent a cheap studio in SF (or as cheap as one can manage) run for mayor, raise 100K, take the 400K "matching" funds, use the money to establish a nice campaign HQ somewhere up in the hills, borrow some more money from myself, lose the election, then give myself the campaign HQ (which should be located near some convenient fishing stream ... ) to pay off the debt. An excellent investment strategy. Certainly a better return than anything I have been to get of the stock market. Unfortunately, you missed your opportunity this cycle, as I believe the deadline to file for this election cycle has passed. Sorry I did not provide you with earlier notification. It'll be interesting to see how many of our mayoral wannabes run afoul of campaign contribution and ethics rules. It is already starting to look like a Lawyers Full Employment Act with the accusations and court challenges. That's good. We have a lot of lawyers here.They need something to do. Hey mw, thanks for the post, I didn't realize this year would be SF's first election with ranked choice. 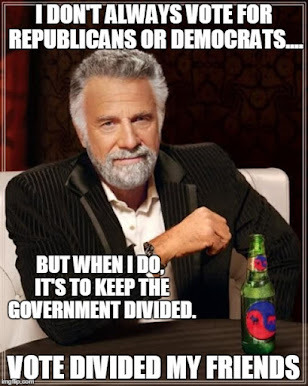 Do you have any idea how it is will work in conjunction with top two, or does top two not apply to elections other than for state legislature, US Congress and statewide office? I'd say it's not so bad for San Francisco voters to have choices - better than 2-choice system. As to Oakland in 2010, Jean Quan would have defeated Don Perata one-on-one last November. We know that because more voters ranked her ahead of Perata than the other way around, even as she won the most votes by an Oakland mayoral candidate in almost 2 decades. That race shows why we should have runoffs or instant runoff voting in races with candidates - to find out which of the top candidates does best when matched against the other top candidate. * This is not San Francisco's first RCV elections. It has held them every November since 2004. It's the first open seat mayoral election with RCV. For more on Bay Area election history with RCV. * Top two doesn't apply in San Francisco. If it did, this field of candidates would have been reduced last June to two candidates in a low turnout election, with the general election only with 2 choices.